Business travel is usually an exercise in packing light so you can move fast. It means not carrying a big suitcase — road warriors definitely do not check their bags — and it means not carrying a heavy briefcase. One way to lighten your load is to stop carrying papers. Many offices are trying to cut back on paper usage, especially since a lot of it gets thrown away or recycled, and the rest gets stored away, likely to never be seen again. Consider this from Entrepreneur magazine: One four-drawer filing cabinet holds as much as 20,000 pages, costs $25,000 to fill, and $2,000 to maintain each year. Eliminating paper from your office saves money; eliminating it from your briefcase saves you from a backache. It’s possible to avoid nearly all paper in your life if you go digital, keeping everything stored in the cloud and on your laptop and phone. You’ll never have to haul paper around again, and you’ll have easy access to everything you thought you’d need. Here are five ways to eliminate paper from your business travel, and your life overall. 1. Use a business card scanner. You can cut down on the number of business cards given to you by scanning them as soon as you receive them. Use an app like Evernote or FullContact to scan the cards. It takes a few seconds for each card, and then you can pitch the card or give it back to the person who gave it to you. Then with an automation service like If This, Then That or Zapier, you can sync those scanned cards up with your phone’s contacts, Google Contacts, or LinkedIn profile. 2. Use an app to scan in all documents you receive. Just like you can scan business cards into your phone, you can use a similar app like Evernote or Evernote’s Scannable app to scan new documents. If you’re given a contract or even a meeting agenda, you can scan it quickly with Scannable and send it to yourself or upload it to your favorite cloud storage service. Tag it with a few keywords to remind you what the document is about, and you can always find it later on. Then just give the original back to the other person, or recycle it immediately. 3. Ask people to email PDFs and Docs to you. If someone hands you a printed piece of paper, there’s a better than 99% chance they created it on a computer. And if they did that, they can email a copy to you instead. Which means there’s no reason to carry the paper around in the first place. Most office people use Microsoft Word, which creates small documents that can be easily emailed. Even Apple users can open a Word document in Apple’s Pages word processor, which means both Windows and Macintosh users can open them. Ask for all meeting agendas, notes, and other documents to be emailed to you instead of being printed out, and be sure to do the same thing for them. If you don’t want people to be able to change or edit your document, export it to a PDF. It’s under the File –> Export menu in both Pages and Word. Then just send the new copy onto whoever needs it, and store your version in the cloud or on your hard drive. 4. Use Docu-Sign to sign contracts. If you’ve ever had a contract emailed to you, you’ve probably been told you need to print it, sign it, scan it, and send it back. You don’t. At all. With an app like Docu-Sign, Adobe Reader, or even Preview for Mac, you can open the emailed contract, sign it electronically, and email it back to the sender. You haven’t created any paper, and the signature is just as legally binding as if you wasted part of a tree to do it. Plus, if you use something like Docu-Sign, the document is time stamped with your signature as well. You can even import a real signature as a jpeg and drop it in, so it looks like you actually did print and scan it. Docu-Sign works on your phone, tablet, or laptop, and you can save your signed contracts to your favorite cloud storage service, rather than stuffing it in a filing cabinet for later referral. 5. Store and share your documents via the cloud. If you’ve got important documents you need to save, whether you’ve scanned them in via Scannable, or someone sent you a PDF or Word document, you can save them to a cloud-based service like Dropbox or Google Drive, which are easily accessible as long as you’ve got a wifi connection. Save all your documents to the cloud service and then just access them as you need them. But just because the documents are in the cloud doesn’t mean you’re cut off if you don’t have wifi. Dropbox creates a folder on your laptop and stores a version of your documents there; it stores the original if you’re the one who created the document. And it’s possible to use Google Drive offline with a simple change. Share documents with colleagues electronically, keep documents you might need later, and make changes and upload the updates at your convenience. Additionally, several people can work on a single document at once on Google Drive (Microsoft 365 does this as well), letting you make changes and updates together. Finally, Google Drive can open Microsoft Word documents, so you can ask your colleagues to share documents with you in Google Drive and you can open them there. 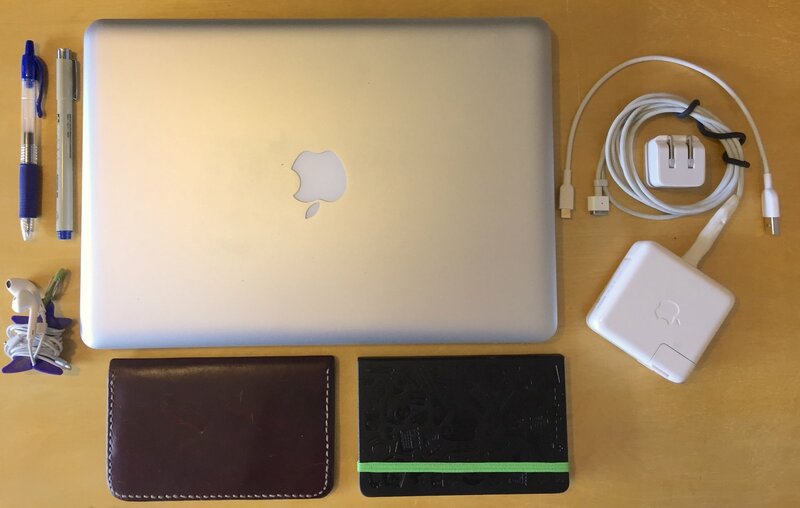 You can adopt a paperless practice for your business travel if you just follow these steps. Ask people to email documents to you, but scan them in when someone hands paper to you. Sign contracts electronically so you don’t have to keep a real copy, and store everything in the cloud so you don’t have to lug it all around in case you need it. Rather than printing out your boarding pass at home, or printing it at the check-in kiosk at the airport, just download your airline’s app, and check in 24 hours before your flight. When you get to the airport you can use the special code on your phone to scan your way through security and onto the plane. How do you go paperless for your business travel? Do you just carry big notebooks around and hope you might need the paper, or have you embraced the 21st century and gone on a paper fast? Share your ideas and techniques with us on our Facebook page, or on our Twitter stream.